Norcross, is one of Gwinett County’s oldest and most popular cities. 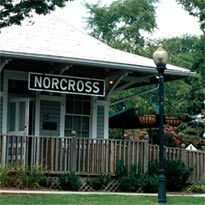 Norcross was created and maintained to be a resort town for wealthy Atlantans. It was named after Jonathan Norcross, a former mayor of Atlanta. Norcross has certainly maintained its resort town character. While it has basked in the prosperity of nearby cities and successful corporations dotting its fringes, Norcross retains its small town charm and tourist appeal. Many times, it has been called “an island in the midst of intense commercial development. That expression correctly describes Norcross; it is indeed a quiet, green, mainly residential area, in the midst of high quality high-tech industry. This picturesque city has a beautiful 112-acre district in the Peachtree neighborhood that is listed in the U.S. Register of Historic Places. The downtown area also provides residents and tourists alike with plenty of recreational choices. People come to Norcross to enjoy the relazed atmosphere for family and community outings, to take a break from city life. Norcross real estate has one of the strongest markets among all Atlanta Georgia suburb homes. One of the best areas of Norcross is Peachtree Corners. Peachtree Corners real estate homes offer family-oriented, upscale living. Whether you wish to buy a luxurious vacation home, a single-family home, a townhouse, or any other residential unit available in Norcross, you can count on Executive Home Sales and the Terry Hayes team to help you out. Contact us today to begin the process of acquiring your dream home in Norcross or anywhere else in the North Atlanta market.